I personally didn't care much for the original The Wall album, giving it a rating of three stars. It had some good material, but was excessively overdone and longer than it needed to be resulting in endless CD-skipping filler. 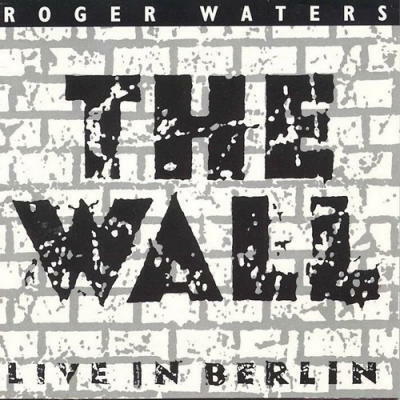 Now with the dismantling of the Berlin Wall in 1989, Waters obviously saw a commercial opportunity to perform The Wall live at the remnants of the Berlin Wall. Clearly the bulk of the storyline of The Wall has nothing to do with the Berlin Wall. It is probably only at the ending through the lines of "tear down the wall" do the two have somewhat of a similar yet vague meaning, chiefly dealing with the concept of the problems of building up walls between us. Yes, at its simplest, this is the only connection they have. However, I believe there were some charitable reasons for the concert, so I can't knock the idea completely. One of those "take the good with the bad" situations. I guess to make the performance more palatable for public consumption, Waters invited numerous 1980s pop stars to make guest appearances. These included the Scorpions, Cyndi Lauper, Thomas Dolby, Paul Carrack, the Hooters, Sinéad O'Connor, Bryan Adams among others. Not the biggest names, but enough to catch the attention of the mainstream music media. Indeed, I believe 300,000 or more showed up to the concert, with many millions watching it on TV. Unfortunately, at best, the performance is mediocre. The guest stars rarely fit their roles well in the character portrayals or the songs they performed. O'Connor singing on Mother was a misfit at best, though she does have a beautiful voice. The overall feel to me was a transformation of the "Pink Floyd" Wall into an almost 1980s pop version/Radio K.A.O.S.-ized version of The Wall. In other words, rubbish. Definitely for collectors and Roger Waters fans only. Two stars.